Renting out retail spaces for pop-up shops in NYC and SF is really expensive. There are rental costs, construction costs, transportation costs, staff costs, and if you're not already located in the city, travel costs. There's also the issue that a lot of people will never even see your display. People may not show up. 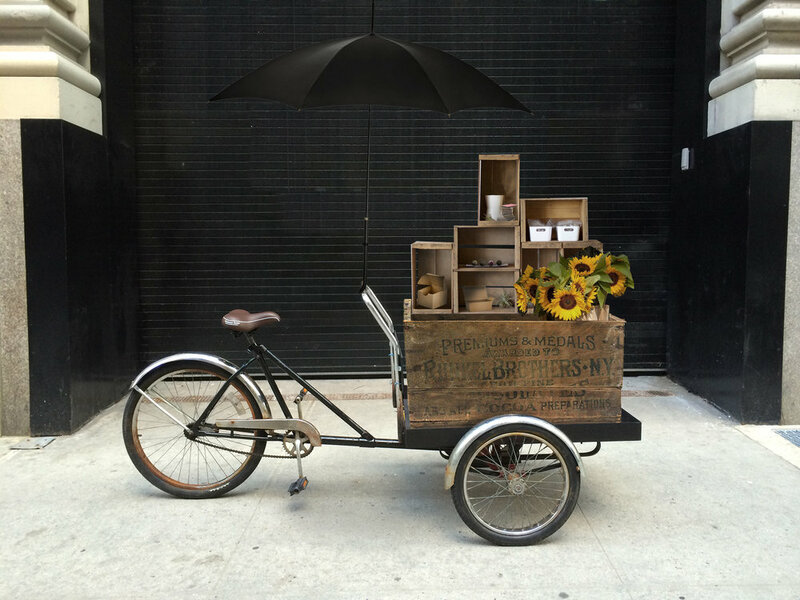 Build a mobile shop that anyone can peddle around. Turning a tricycle into a mobile shop or display is a lower cost solution to promote work, with greater outreach and views. Plus, they look cool, and stop people in their tracks. They fit in the bike lanes in New York and San Francisco, and have good space for a well-designed crate. Peddler Pop-Ups has been hired for advertisements, retail, and entertainment. I rented out a fleet of tricycles when I lived in New York to small businesses and large corporations to create mobile displays and memorable ads. The tricycles have been rented by companies including: Viacom, Nickelodeon, Cobble Hill Juice Company, Bond Collective, and Ruby Rockets. I worked with brands to create the custom displays. One of my favorite displays was a moving desk on wheels for a coworking space. I originally used the tricycle for Inkwell Helmets, to sell helmets at Citibike stations with a mobile POS.